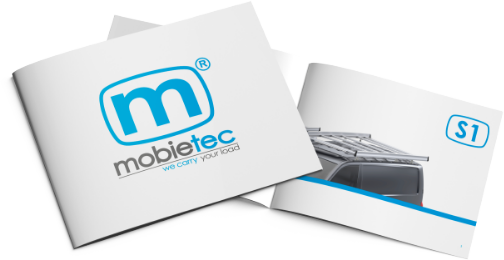 mobietec has a wide range of different accessories. Due to the T slot, incorporated in the profile of the roof racks, assembly of various accessories is easy. In order to be able to move smoothly onto the roof, a walking plate can be provided. M-tubes are very suitable for a safe and efficient transportation of long tubes. These are available in different lengths up to 6 meters and have a lockable cover on both sides. Furthermore, the roof racks can also be equipped with a flashlight support, a ladder stop or an integrated ladder. In addition to the standard equipment, glass carriers can also be foreseen with accessories, increasing their user friendliness and improving the safety of the load. Supplementary horizontal profiles can be added to the rack, so a ladder can be built in. These horizontal profiles are being mounted between two vertical profiles. Extra fixations bars, to secure the load even better or a "wheel plate" as protection against stone-dust during transport, are also possible options. In the vertical and horizontal profiles, stainless steel lashing eyes can be fixed, so the load can be secured extra with ropes. Often the glass racks are being mounted in front of a wheel arch. Replacing a flat tire can be a real hassle in that case. That’s why our glass carriers are all tiltable, so the wheel is easily accessible. Maybe this is not the way you’ve imagined replacing or fixing a tire. Then we can offer you the following solution: a removable piece near the rear wheel.